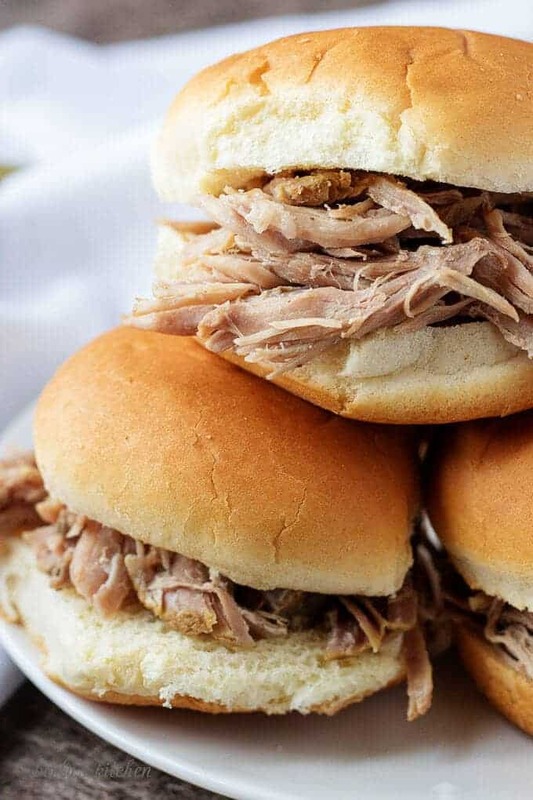 A pork pot roast sandwich is the ultimate grab-and-go meal. Warm, tender pot roast flavored with carrots, onions, celery, and seasonings, nestled between two soft buns. Are looking for the perfect handheld comfort food? Imagine a slow-cooked pork pot roast that’s been simmering in a savory broth for hours combined with carrots, celery, and onions. When seasoned with thyme and garlic it makes for the ultimate sandwich meat. Kim and I originally published this recipe in February of 2016. However, we felt it was time for a make-over. 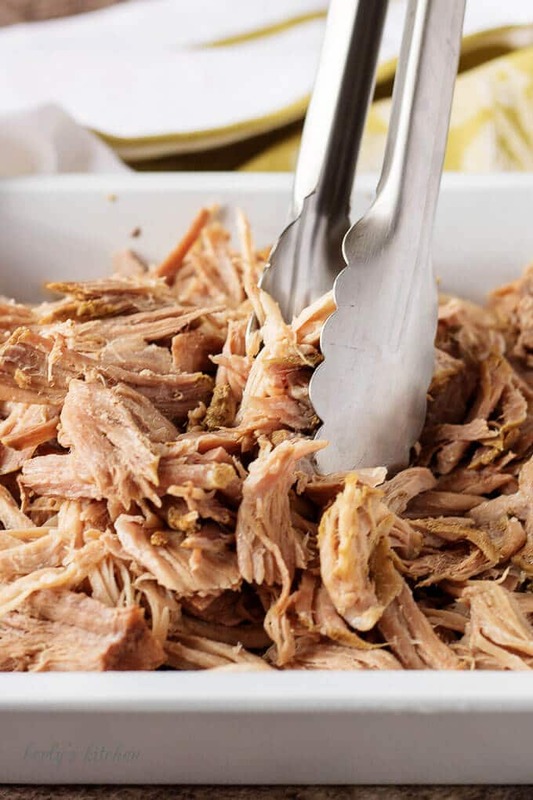 If BBQ is more your thing, then checkout our BBQ pulled pork shoulder. The first post utilized a beef pot roast, but this time we wanted to show the recipe would work with a pork roast as well. The meat turned out flavorful and juicy. We know you can’t wait to make this one yourself. First, preheat your crockpot or slow-cooker and gather all your ingredients while you wait. After letting the pork pot roast cook for a few minutes, put in the onions, carrots, celery, and garlic. Don’t add the beef broth yet, let everything for a minute or two. Then slowly pour the broth into the cooker. Once the broth is added, put the lid on the slow cooker and walk away. Now, cook on high for about 5-6 hours, low for 7-8 hours, or until meat breaks apart with a fork. Once the roast is completely cooked, I separate it from the liquid. Next, the liquid is strained placed it into a stock pot. This is optional, but it is a good idea to reserve some liquid for reheating the roast. Warming the roast in a couple spoonfuls of liquid will keep it from drying out. Also, it makes a great dip for the sandwich! Now that the roast and liquid are separated you can build your sandwich. Simply cut open your hoagie and place the meat inside. Once you’ve strained the broth, cook it down in a saucepan over high heat for 5-minutes to create a flavorful dipping sauce. Although we haven’t tried it, you could substitute the roast for 2-lbs. of chicken breast and substitute chicken stock for the beef stock to make a low-fat option. 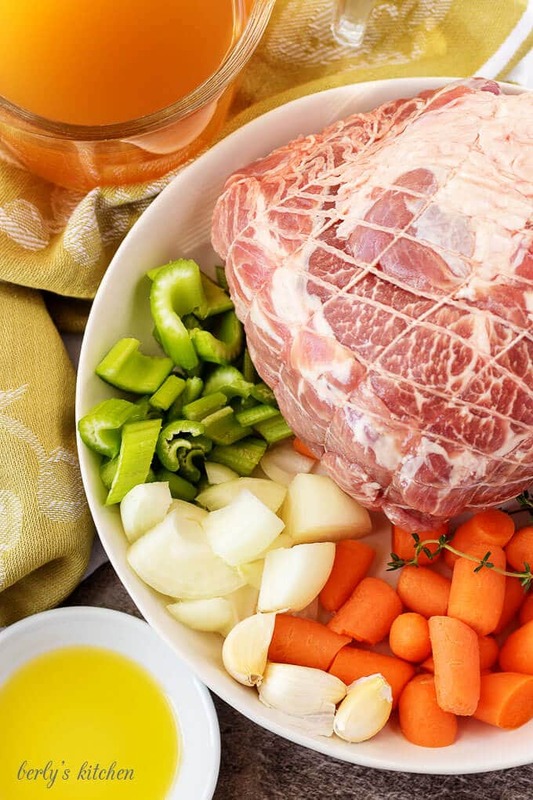 To keep the pork pot roast from drying out in your fridge, pour enough of the broth in the container to cover the roast in about a 1/2-inch of liquid. If you liked this sandwich then try our Grown Up Bacon Grilled Cheese or our Slow Cooker BBQ Chicken Sandwich! 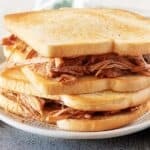 Pot Roast Sandwich - tender, flavorful, and simple. This EASY slow cooker meal is a great option for a busy family. Turn slow cooker on and allow to heat. Drizzle olive oil in slow cooker. Add roast and season with salt, pepper, and thyme. Add carrots, celery, onion, and garlic. Cook roast until a crust forms. Cook on high for 5 - 6 hours or low for 7 - 8 hours. Meat will break apart easily with a fork when done. Reserve liquid to reheat roast or to use as a dipping sauce. Place pot roast in warmed hoagie rolls and serve immediately. Can be stored in the refrigerator for 3 - 4 days. *Calories do not include bread or bun. 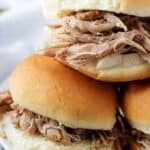 I love a good slow cooker meal and my boys do too! Looks delicious! You have nailed it! If there is enough broth, you could cook some noodles in it, too. Yummy! I haven’t pre-heated my slow cooker before. This is a great tip! 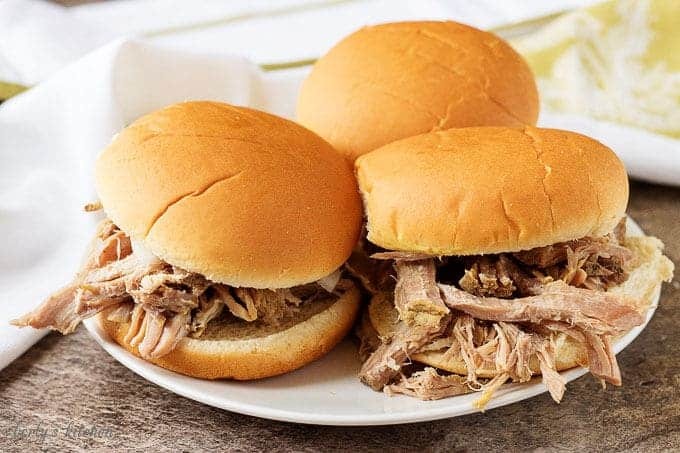 I love pulled pork I make at home.